RALEIGH, N.C. - It might have been the nine-hour flight from London, complete with terrible airline food and a lady behind me who kept tugging on my seat back. It might have been that the only movies on the flight were kids films featuring Brendan Fraser, or that it took 30 minutes to clear customs from just one plane. It might have been that my rolling suitcase came out of baggage claim bent like a banana, sopping wet and with just one wheel intact. Whatever it was, I just wasn't in the mood to see what I saw as I walked into the airport convenience store near the gate for my connecting flight back home to Baltimore. All I wanted was some peace, quiet and a Diet Dr. Pepper. 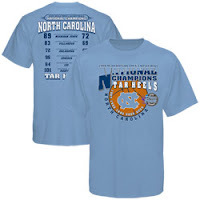 And it makes sense that they'd have National Championship gear on sale as well. Again, no problem there. But this shirt just set me off. Well, not this one exactly, but one very much like it. It featured very prominently a certain lopsided score from a certain championship match this past April that shall go unmentioned. And it made me want to puke. Now understand, there's nothing TECHNICALLY wrong with the shirt. It's not out of bounds to have or wear. And all the Carolina fans that noticed my Steve Smith charity golf outing carry-on with the MSU bag tags were really sympathetic - saying we had a great young team and a great coach and that we'd "win it again soon". Carolina fans are polite like that (they were in after they won in the 2005 Final Four as well). But, cranky as I was, I didn't care. I still don't. All I can think of when I think back on that accursed shirt in that accursed store in that accursed state is that MSU gets to play UNC again next year. One more chance to right the wrongs of last season. But not in Detroit - this one's in Chapel Hill. I hope we win. I hope we win huge - and make a t-shirt to remember it by.